I always make sure an author whose work I love goes up on April 2 as a sort of birthday present to myself—and I am delighted that today’s guest post is by Rachel Hartman! 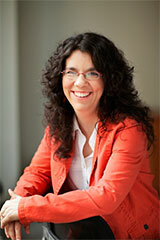 Her debut novel, Seraphina, became a New York Times bestseller and won the Morris Award after its release in 2012. It’s a beautifully written, compulsively readable story with a wonderful heroine (and, of course, dragons!). 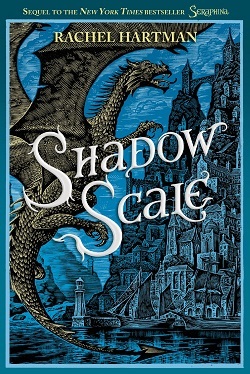 The sequel, Shadow Scale, is now available. 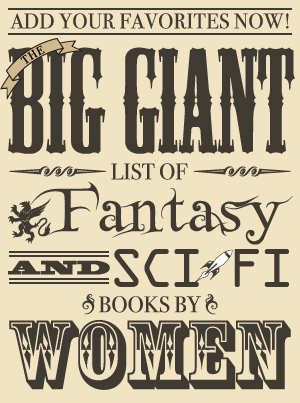 Happy Women in SF&F Month, darlings! I am so pleased to have been included in this year’s line-up of guest posters, not least because it’s a wonderful excuse to talk about one of my favourite topics: gender. Not just the feminine gender, specifically, but gender in general. What is it good for? How can we stretch it? Is it ok if I break it? Of course, women writers have a long history of using the powers of SF/F for good (or possibly evil) gender explorations, from Ursula Le Guin’s classic The Left Hand of Darkness to Ann Leckie’s recent Ancillary Justice series. SF/F is uniquely suited to such thought experiments; one can set up the parameters of a world, extrapolate them to their logical conclusions, and then run characters through the maze. I would almost argue that that’s what SF/F is for. I recently ran some thought experiments about gender myself in my latest novel, Shadow Scale. I created a new gender-organizing system for the city-state of Porphyry, and since readers have begun asking me about it, I thought this might be the place to explain what went into its creation. I’ll start with a caveat, as I so often do: this is not the right or only way to come up with a new gender system. This system is closely tied into my own feelings and experiences of gender, which are possibly different from many people’s. If parts of it strike you as terrible, complain away. Honestly, I’m happy if I can get people thinking and talking. My motives were pretty straightforward: a delightful transwoman character had occurred to me, and I wanted a place to put her where she could blossom and thrive and be herself in as straightforward a manner as possible. She was going to have plenty of problems, just by virtue of being a character in one of my novels, but getting along in her own society didn’t need to be one of them. I wanted to create a gender system I would be comfortable with as well, and that was a distinctly different undertaking. There are several areas of my life where a distinct anarchic undercurrent bubbles to the surface. Art is one; gender is, alas, another. It’s not that I don’t believe in gender, or believe it’s important. Every day people risk their lives – and lose them – as they struggle for the right to express their gender the way they need to. I don’t ever want to lose sight of or minimize that fact. However, I personally find that the trappings of gender don’t mean much to me. Gender may be universal, but most of its signifiers are culturally specific, and as such they feel artificial (to me – I can only speak for myself, here). I chafe at the idea that people imagine they know anything about the inside of me by glancing at my outside. My long hair instantly says “feminine” to people in my culture, but does it have to? I think of it as Frank Zappa hair, or Weird Al Yankovic hair. I feel like it should matter first and foremost what my own interpretation of my hair is. I want to be the one who gives meaning to the way I look, not have interpretations imposed upon me from outside. I get my hackles up in exactly this way about art as well. Apparently I just don’t like to be told what to do (or what I really mean). So how could I create a system that could accommodate both Camba, my trans character, and me, the pugnacious contrarian? The first thing that occurred to me was a tripartite system, like one finds in grammatical gender systems. I took four years of ancient Greek at university, you see, and I like to pull it out and dust it off occasionally. Ancient Greek (like modern German) had three grammatical genders: masculine, feminine, and neuter. That seemed workable – we could put Camba at feminine and me at neuter (if I was in the mood for that) – and yet I felt it lacked nuance. Surely there are different flavours of masculine and feminine (and neuter!). It’s like a political party system: there are the people who are totally on board with every platform their party proposes, and there are the people who pick and choose the parts they want and have reservations about the rest. How many people wholly, unambiguously fit every characteristic of their gender? I’d think most people don’t even come close (but then, I’m the gender anarchist. I would think that). So I doubled the number to account for the possibility of nuance, and that brought me up to six genders. What a lovely number! A perfect solid, a six-sided die for the Porphyrian god of Chance to roll. So what are the faces of this cube? Two simple genders would correspond one-to-one with the body at birth. I called these Naive Masculine and Naive Feminine. I realize not all bodies are born distinctly male or female, but there are still four genders left to choose from. If an intersex individual wishes to present a specific gender, they might choose the more complicated variant of each, which I named Emergent Feminine and Emergent Masculine. Trans people would also find these the logical choice. But any Porphyrians might consider themselves Emergent if their relationship to their gender cannot be quickly summed up, or understood at a glance. Emergent simply means one’s gender is best understood through conversation, not assumption. It seemed right to me that there should be two opposing poles of neuter as well (“neuter” is an unfortunate word, associated with pet sterilization, but it’s also the grammatical term and I kept it on as such). On one face, I put Cosmic Neuter, a gender that would warmly encompass all genders and would refer to the gods themselves (for who could impose the limits of any one gender on the gods?). The opposite face, I called Point Neuter. The opposite of all was surely none, so Point would be something singular and complete unto itself. The gender of I-can’t-be-bothered-with-gender. I might place myself here, on my most contrarian days. Now please note that I’ve said nothing about sexual orientation; that’s because these do not correlate to Porphyrian genders. One might be asexual, for example, and present as any one of these genders. The notion of sexual orientation would be a little peculiar to a Porphyrian; love is between individuals, whoever they might be. If there are six genders, the obvious first question is: how are people going to cope with not instantly knowing someone’s gender on sight? I solved this problem with a default gender, Cosmic Neuter, that would be used for all strangers. It is, as you recall, the gender of the gods. That seemed most polite; it’s always best to err on the side of assuming someone is a god. Asking about correct address would, of course, be necessary in every case, and just a part of politeness. I love it when languages have verbs we don’t have in English, and “How may I pronoun you?” struck me as a most charming and gracious question. But how would people know how to pronoun themselves? There would be a of rite of passage at age fifteen, a day when you choose what pronoun you will bear as an adult. Young children would all be considered Point Neuter until the Day of Determination. Even then, it’s still possible to misgender yourself; some people seem to know from the day they’re born, but for others fifteen may still be too soon to really know yourself. Camba did this, but all was not lost. She was able to re-pronoun herself later. Anyway, that was the process I went through in coming up with this system. I feel pleased with it, not least because there’s a distinctive gender for people who can’t be bothered about gender. I suppose I’m a little like an atheist who invents a religion (full disclosure: I am also an atheist who has invented a religion), but I like to think that gives some balance to the whole thing. You can opt in, you can opt out, you can be as complicated and contrarian as you want to be. 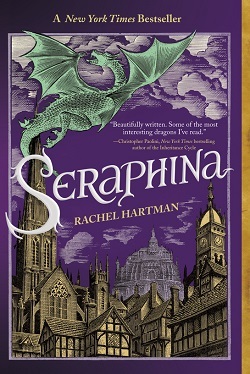 As a child, RACHEL HARTMAN played cello, lip-synched Mozart operas with her sisters, and fostered the deep love of music that inspired much of her award-winning debut novel, Seraphina. Born in Kentucky, Rachel has lived in Philadelphia, Chicago, St. Louis, England, and Japan. She now lives with her family in Vancouver, Canada. To learn more, please visit RachelHartmanBooks.com and follow her on Twitter @_rachelhartman.